You are here: Home / Locations / Staunton, VA – N. Augusta St. 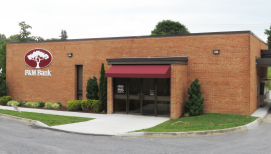 Welcome to F&M’s second location in Staunton, VA. We are near the College Park neighborhood of Staunton, on N. Augusta St. between Christ Evangelical Lutheran Church and Kjellstrom and Lee Construction. When you arrive you’ll find a one-story brick building with a red awning and F&M’s red and white tree logo to the left of the front doors. We have plenty of parking and a four-lane drive-thru for your convenience. As a longtime community bank, F&M understands the importance of small businesses to a vibrant town. That’s why we are proud to support the local economy through our Perks @Work program, which helps small businesses provide savings and discounts to their employees, and connect with potential customers. Staunton’s own Warehouse Auto Repair was F&M’s May 2017 featured business. F&M’s employees also volunteer time and money to local causes through our “Casual Fridays for Charity,” which benefits different organizations each month. Invest in your financial future and your community by choosing a local bank. When you open an account with F&M you get the same services and convenience offered by national banks, plus hard-to-find perks such as ATM fee refunds, high interest checking, and debit card cash back. But what truly distinguishes a community bank is its personalized, friendly service. Don’t be surprised when your local branch greets you by name. Our professional employees offer individualized service and help you find the financial products and solutions that will best serve your goals. F&M Bank Corp., our parent company, has ranked 4th out of 13 Virginia banks on the American Banker’s top 200 list of publicly traded community banks. Discover the responsive and reliable service that only a progressive community bank can provide.